Not to be confused with Pineios River (Peloponnese). The Pineiós (Greek: Πηνειός, Greek pronunciation: [piniˈos], referred to in Latin sources as Peneus) is a river in Thessaly, Greece. 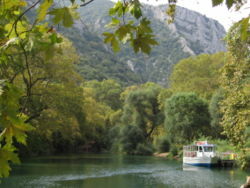 The river is named after the god Peneus. During the later Middle Ages, it was also known as the Salambrias or Salabrias (Σαλα[μ]βριάς). It flows from the Pindus mountains and empties into the Aegean Sea, northeast of Vale of Tempe, near Stomio. It creates a large delta, well known for its beauty and for many animal species, protected by international environmental treaties. Its total length is 205 km. Its source is near the village Malakasi, on the eastern slope of the Pindus main range, east of Metsovo. The Meteora region and the city of Larissa lie along the Pineiós. 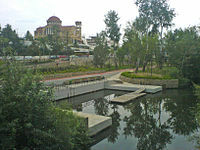 Trikala lies on its tributary, the Lithaios. In the 1960s, a freeway connecting Athens and Thessaloniki was constructed in much of the Vale of Tempe. Pineios major tributaries are: Malakassiótiko réma (stream), Mourgkánis (stream), Portaikós, Lithaíos, Pámissos, Enipeas and Titarisios. The Pineios flows along the following places, from the source downstream: Malakasi, Kalampaka, Megarchi, Megala Kalyvia, Farkadona, Larissa, Evangelismos, Omolio. This article related to a river in Greece is a stub. You can help Wikipedia by expanding it.